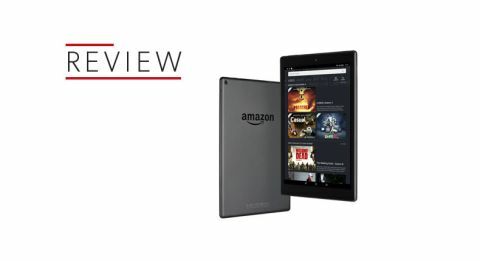 Amazon Fire HD 10 review | What Hi-Fi? Almost every product we review, whether it’s a £50 portable music player or a £50k pair of loudspeakers, is a compromise. The question almost always is: can you live with the compromises the product demands? The Fire HD 10 is a compromise more acute than most. But a glance at the star rating at the top of this review is a strong hint that we consider its compromises worth accommodating. Context is everything here. The Fire HD 10 is a big tablet (10.1 inches, in fact, as the model name almost suggests) and it shouldn’t come as any surprise that a tablet this big, at an eye-catchingly affordable price as this, isn’t the last word in luxury. There’s a lot of plastic here, and it’s not that soft-touch non-flex stuff more expensive rivals are routinely made from – the Fire HD 10 is unyielding to the touch and not immune to creaks and groans, even if it stops short of flexing too obviously. Further evidence of Amazon’s desire to bring the Fire HD 10 in at an aggressive price comes in the form of its sockets and controls. They’re all grouped together along one of the short ends of the frame – which is not the last word in convenience. Using this tablet in ‘landscape’ configuration (as you might when watching videos) isn’t too wearing – even if the volume controls are uncomfortably close to the headphone socket. But in ‘portrait’ mode (when using the tablet as a book or newspaper) the design puts the power and volume controls far from your fingers. And, as this is a 16:10 aspect ratio tablet, it’s tricky to operate one-handed unless you have hands like a goalkeeper. It shouldn’t come as any surprise to know the Fire HD 10 is part of the Amazon eco-system, which is great if you’re an Amazon Prime customer, but inconvenient if you’re hoping to use Google apps (Maps, Play, YouTube and so on). You can’t. Our review sample is the 32GB model – a 64GB version is also available, and both have a microSD card slot to expand memory by as much as 256GB. There’s 2GB of RAM and a 1.8gHz CPU charged with handling apps and the control interface. There’s not a great deal more to the Fire HD 10. The camera at the rear is a flashless affair of a mere 2MP, while there’s a 640 x 480 snapper unit on the front. Software-wise you do at least get HDR mode, though it’s pretty slow-witted, so you’ll need to keep very still if you’re taking HDR photos. Battery life is decent, at 10 hours or so, but charging from flat takes an eternity. Actually it's around four hours for a full charge, which can (in the right circumstances) feel like an eternity. Amazon’s Alexa voice-assistant is onboard and, while rather hard of hearing in an office environment, is reasonably sharp-eared in quieter rooms. Functionally, Alexa will do everything here Alexa does on, say, an Amazon Echo, so you can ask it to play music, tell you the time or give you the latest weather forecast. A tablet this big is likely to be pressed into video service, and the good news is that the screen resolution (1920 x 1200) is a big improvement over the previous Fire 10 tablet and makes watching films an authentic pleasure rather than a trial. The contrasts, deep blacks and rugged skin-tones of There Will Be Blood (via Amazon Prime Video) are all impressive, and the Fire HD 10 demonstrates a decent facility with motion. The picture isn’t the out-and-out cleanest we’ve ever seen – there’s some shimmer and noise in the shots of the big Southern California sky – but it remains reasonably composed in all but the most testing circumstances. Picture upscaling is an inevitably hit-and-miss affair. Should you be prepared to go around the houses to watch a YouTube video (there's no app, don't forget), and it’s low-resolution to start with (our current favourite is Motörhead and Girlschool’s Please Don’t Touch), the Fire HD 10 does nothing but exacerbate its problems. The image is soft and easily flustered by motion. But the Amazon isn’t alone in struggling with content of this type. Sound, on the other hand, is a much more assured affair even when the going gets low-res. That’s when you’re using headphones, of course – there’s a limit to what a tablet’s integrated speakers can do, even if they are ‘Dolby Audio’ branded. The Fire HD 10’s stereo speakers are widely spaced along a long edge, and they’re reasonably distinct and open-sounding, but they’re equally lightweight, edgy and, over time, borderline irritating. Appropriate headphones, on the other hand, (ideally something like AKG’s multi-Award winning Y50s) allow the Fire HD 10 to impress. A 320kbps Spotify-derived file of Fever Ray’s When I Grow Up is nicely balanced through the frequency range. There’s decent detail on display, good separation and focus and, crucially, the Fire HD 10 is believable and reasonably subtle in the mid-range. Up the ante a little with a 24bit/44.1kHz file of Kendrick Lamar’s King Kunta and the Amazon gains in confidence. Low frequencies are hard-hitting and controlled, the plaintive malevolence in the midrange is unmistakable, and the top end shines without threatening harshness. It’s obvious the digital-to-analogue chipset sitting behind the Fire HD 10’s headphone socket is at least the equal of some much more expensive tablets. Amazon is coy about the upper limit of the file sizes the Fire HD 10 is able to cope with, and the amount of downscaling (if any) it needs to do with higher-resolution stuff. But we do know that it has no truck with our 24bit/192kHz library of content. As we said, everything’s a compromise – and that’s particularly true of a product that wants you to be a slave to Amazon’s eco-system. But if you can deal with that element of the Fire HD 10’s personality, you’ll find its audio and video performance well beyond the standard a £150 price tag suggests. It's a fine budget buy.